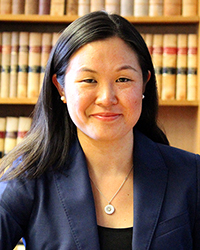 Likim is a PhD candidate at the ANU College of Law, Australian National University, where she has taught in the areas of legal theory, critical legal theory and human rights law. Her research is supported by the Australian Government Research Training Program. She obtained a Masters in International and Comparative Law at the University of Helsinki where her thesis was accepted with Exceptional Praise (2013). During her PhD studies, she was awarded a visiting fellowship with a mobility grant scholarship to the Human Rights Institute of Åbo Akademi University, Finland. Prior to commencing at the Australian National University, Likim worked as a Judge's Associate at the Federal Circuit Court of Australia assisting Judge Street and Judge Driver to judicially review protection visa matters. Previously, she has worked as a legal intern at the International Criminal Tribunal for Rwanda in Tanzania and the Special Tribunal for Lebanon in The Hague. Her primary research area focuses on critical legal theory approaches to refugee law particularly the heightened security focus on the asylum procedure. Her PhD topic looks at the intersection between refugee law and international criminal law namely the exclusion clause of the Refugee Convention. Ng, Likim, 'Securitising the Asylum Procedure: Increasing Otherness through Exclusion', No Foundations- An Interdisciplinary Journal of Law and Justice, NoFo15 2018. Ng, Likim: 'The transfer cases of the ICTR to the Republic of Rwanda: The challenges of implementing Rule11bis'. Listed in United Nations Mechanism for International Criminal Tribunals International Criminal Tribunal for Rwanda (ICTR) Special Bibliography. MICT Library: 2015. 'Excluding refugees for security reasons and the state of exception', Vertigo: Fake News/Real Theory, Critical Legal Theory Symposium (Australian National University, 12 December 2018). ‘Securitising the asylum procedure through exclusion: a form of regenerating the European space’, Critical Legal Conference (Open University Via Skype, 6 September 2018). Speaker at Refugee Law Panel, (Australian National University, International Law Society, 22 August, 2018. ‘Securitising the asylum procedure through exclusion’, Refugee Law Initiative Conference (University of London, London, 28 July 2018). 'The Impact of the 'Securitisation of Migration' on Refugee Law: the role of exclusion through Article 1F', The Migration Conference (Universidade de Lisboa, Portugal 28 June 2018). 'Securitising the Asylum Procedure: Increasing Otherness through Exclusion', Pre-launch of Special Edition for No Foundations- An Interdisciplinary Journal of Law and Justice, (University of Helsinki, Finland June 2018). 'Securitising the asylum procedure through the application of the exclusion clause', Institute for Human Rights Research Seminar (Åbo Akademi University, Finland, 16 May 2018). 'Securitisation Of Refugees: A Discourse Analysis Of The Exclusion Clause', International Interdisciplinary Conference on Minority Studies with Women and Gender Studies Conference (Eastern Mediterranean Academic Research Center, Istanbul, 10 November 2017). Ng, Likim, ‘Excluding Refugees on National Security Grounds: Problems and Potentials’, (Asylum Insight- Commentary, December 2018) <https://www.asyluminsight.com/c-likim-ng#.XCv1IBN96u4> accessed 2 January 2018. Under the Refugee Convention, states can exclude asylum seekers from refugee status if they have committed international crimes. My PhD topic looks at how Article 1F otherwise known as the exclusion clause has the potential to take on the burden of a national security provision from other articles of the Refugee Convention. Unlike its intention to exclude those undeserving of international protection, the exclusion clause expands the intention of the article to exclude refugees for the purposes of national security reasons. In the securitisation process, a state of emergency is enacted where it is necessary to suspend law by going above the normal rules and realms of governing. By analysing cases from a critical theory perspective, my project looks at how asylum seekers are presented as securitised by decision makers. For example, excluded asylum seekers are not granted an adequate fair trial process determining whether the international crime has been committed. From the lens of Agamben, the exceptional nature of the exclusion clause becomes the norm where other refugees also become increasingly excluded from the political community. They are unable to access rights such as being subjected to indefinite detention. We see this treatment also applied to 'genuine' refugees who have had an adverse security assessment made against them.